Sometimes the creative work we do is a bit heavy. Take "Thor" (above) for example -- he weighs in at approximately 70 tons and eats mechs (robots) for breakfast. After breakfast, he spends the bulk of his time jumping around (150 meter jumps) and running around (max speed of 86.4 km/h). He carries a long-range missile launcher in his left torso, a PPC (particle projection cannon) on one arm, and a heavy autocannon on the other. Messenger of Peace, he is not. 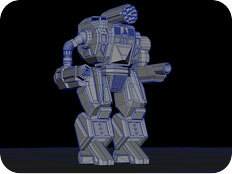 Thor is part of our continued development and work on the MechWarrior Living Legends video game (due in November 2008). Thor is our latest model. It's almost game-ready -- and we can't wait to play it. 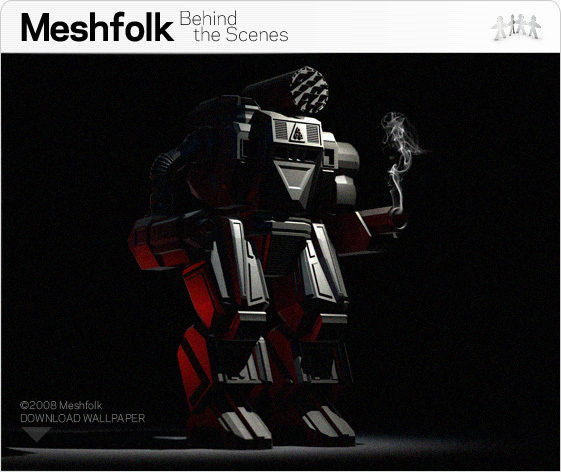 Video game development is just one facet of our creative and technical capabilities at Meshfolk. We also do product visualization, animation, virtual environments, interactive multimedia, web development, graphic design, branding and many other things. Give us a call and tell us about your projects! 203-276-9605 -- ask for Michael.